Given how many of WildStar's early trailers borrowed elements from both Firefly and Borderlands, the emergence of a magical space cowboy class shouldn't be much of a surprise. Also called the Spellslinger, that class is the focus of the latest DevSpeak update from the Carbine team. Don't worry, at no point does anybody say "howdy" or "pardner". WildStar is a game that, up until now, I've been mildly looking forward to. Thanks to this video, it's a game I can finally picture playing. As anyone who's seen me in Guild Wars 2 can attest, pointlessly jumping, rolling and spinning about is my jam. 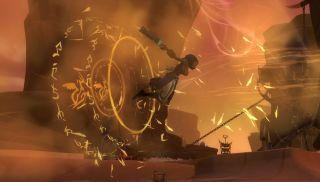 Previous WildStar videos have introduced the Warrior and Esper classes. The game is currently preparing for another closed beta run next month, ahead of its planned release in Spring 2014.